A quick and easy breakfast you can make in minutes and even enjoy on the go. Preheat the oven to 160C/325F/Gas Mark 3. Slice the croissants horizontally, don’t cut right through. 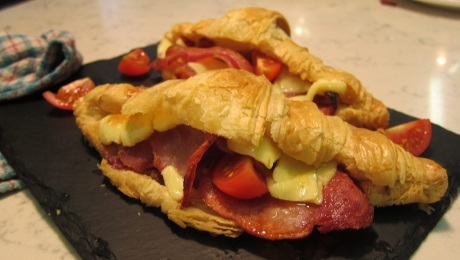 Lay 2 slices of cooked bacon onto each croissants and add some cheese slices. Place in a preheated oven for 3 – 4 minutes until the cheese has melted, then serve immediately with some freshly sliced tomatoes.